Here’s the other side of Austin. The Austin that doesn’t make the national news because it’s not hip or trendy. While this city is known for hipsters and high-tech, there is still a subculture of ranching, agriculture and animal husbandry. As part of my photography, I like to explore both sides. I shot this at Rodeo Austin at the Travis County Expo center, far from downtown, on the east side. Around the same time in March, in the heart of downtown, the now famous SXSW Music, Film and Interactive festivals take place. These events are quite the contrast. One has cowboys, bull riding and livestock shows — the stuff that fits the traditional image of Texas. The other draws people from around the world, particularly those who wear all black that come from the media meccas of New York and Los Angeles. One is traditional, the other, trendy. 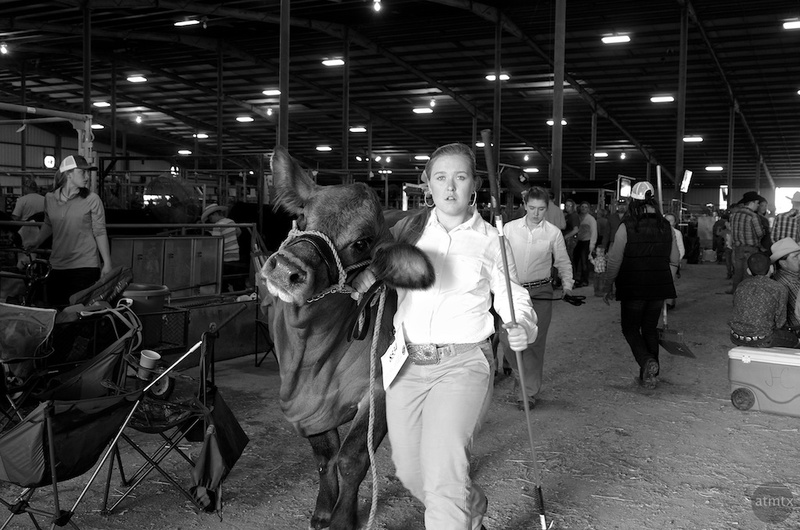 I enjoyed documenting behind the scenes at the livestock show. Nothing official, just a short stroll with my camera, taking in a foreign but interesting culture that I’m not familiar with. I don’t exactly fit into the SXSW crowd either, but being a city person, I’m more familiar with that environment. This is the real Texas, in the modern world. Not the idealized mural on display with faux log cabin walls at a chain steakhouse.